It all starts in the mailroom. No matter the size of your organization, a well-engineered mailroom can increase productivity, maximize efficiency and streamline your workflow. 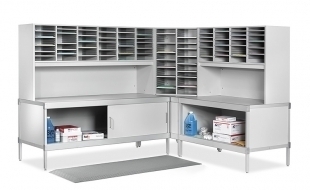 We offer Neopost's complete line of Mailroom Furniture to meet all your mail handling needs. From incoming dump stations to complete sorting systems, modular tables and consoles, the Neopost range of ergonomically designed furniture will integrate perfectly with your mailroom. And, our furniture is constructed of heavy-gauge steel to withstand the everyday rigors of a busy mailroom. 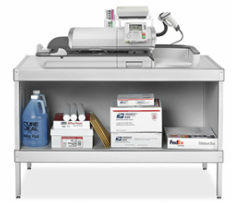 Whether you need a single table or a full mailroom solution, Midwest Mailing and Shipping Systems, Inc. can help you improve the flow of all your mailroom activities. Visit the Contact Us page to reach us for furniture orders.